Language INtegrated Query or LINQ changes the way you write your data driven applications. Previously developers used to think and code differently to access different data stores such as SQL server, XML files and in-memory collections. The new LINQ based programming can take away the hassles involved while developing such applications. In this multi part series I am going to explain how LINQ capabilities can be used ASP.NET applications. The former namespace provides classes that allow you to interact with database whereas the later namespace contains classes and attributes that are used to generate entity classes representing the tables. The public class Employee consists of three public properties viz. EmployeeID, FirstName and LastName. What makes this class special is the [Table] and the [Column] attributes. The [Table] attribute marked on the Employee class indicates that the underlying class represents an RDBMS table. The Name property of the [Table] attribute specifies the name of the database table. If your class name and table name are same you can very well skip the Name property. Notice how in our example the EmployeeID is marked with IsDbGenerated and IsPrimaryKey properties. Also, observe how the Name and DbType properties are used. This completes our Employee class. We used only three columns from the Employees table. You can add extra columns as per the requirement. Any data driven application has some data source from which data is fed into the system. Your application needs a way to talk to this data source. In LINQ to SQL terminology a Data Context does the job of this communication. Programmatically a data context is a class that derives from DataContext base class. The NorthwindDb class inherits from DataContext base class. The custom data context class must provide a constructor with one parameter. The constructor accepts a database connection string and simply passes it to the base class. More interesting is, however, the Table of Employee objects. This is how you expose the previously mapped LINQ to SQL objects to the external world. That's all you have in NorthwindDb class. Now we are ready to consume these classes from our web form. You might be wondering - where is the logic to INSERT, UPDATE, DELETE and SELECT data? That's what LINQ to SQL does for us. All such tasks are taken care internally by LINQ framework. The web form consists of a textbox to filter records based on first name or last name. 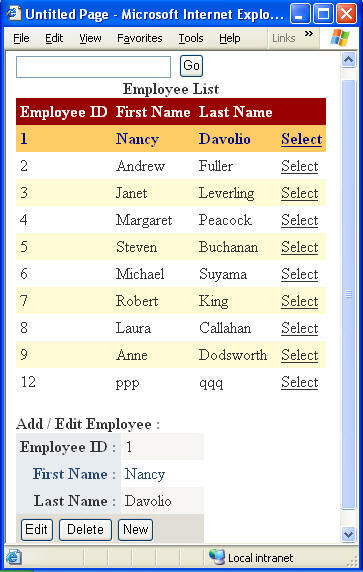 The GridView displays the selected employee records. Upon selecting an employee record its details are populated in a DetailsView for editing. Notice the code marked in bold letters. The code creates an instance of NorthwindDb class (our strongly typed data context) and passes the database connection string to it. In order to select all the records from the Employees table you simply use the Employee Table<> from the NorthwindDb class. To fetch records matching some criteria you use C# language keywords (from - where - select) and find all the employees whose FIrstName contains certain text. In both the results are collected in a generic IEnumerable collection. The BindDetailsView() method is called from the SelectedIndexChanged event handler of the GridView. Now let's see how data manipulation works in LINQ to SQL. First of all we will discuss data insertion. Notice the highlighted code above. We created an instance of Employee class and set its FirstName and LastName properties from the new values entered in the DetailsView. We then call InsertOnSubmit() method on the Employee Table to add a new element to it. Calling InsertOnSubmit() method simply inserts a new element to the Table. To actually add that row to the database we call SubmitChanges() method. The Update operation is similar to Insert with little change. Here, we first find the row matching the EmployeeID to be updated. We then set its FirstName and LastName properties. Notice the use of First() method to return just the first element of the results. Finally, SubmitChanges() method is called as before. Here, we first find the employee record to be deleted. Notice the use of Single() method to fetch a single element. The DeleteOnSubmit() method then deletes the employee object from the Table. Finally, SubmitChanges() method propagates the changes to the database. That's it! Run the web form and test its functionality. In this part we (or rather LINQ framework) used raw INSERT, UPDATE and DELETE operations. In many cases you may want to use stored procedures to manipulate data. That is the theme of the next part of this series.